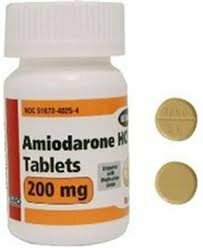 Amiodarone was the first anti-arrhythmic drug I was prescribed when I was first diagnosed with Atrial Fibrillation. It did not work, in spite of being the first drug of choice for most doctors for Afib. I later found out it also had the most and worse side effects of any of the atrial fibrillation rhythm restoring drugs I tried. If that were not enough it made me sicker than the afib. I did not like it – At All! In spite of my experiences with the drug it has helped some people and is very cheap so here is some more info. My doctor immediately put me on Amiodarone after my afib diagnosis – glad you mentioned this.